All of the above options are viable ways to deliver information to our members. In modern practice, content delivery continues to shift from traditional format delivered a few times a year into multiple formats delivered constantly and as available. While some content better lends itself to electronic release (e.g. multimedia), there are many AJJF members who like the feeling of a glossy magazine in their hands. 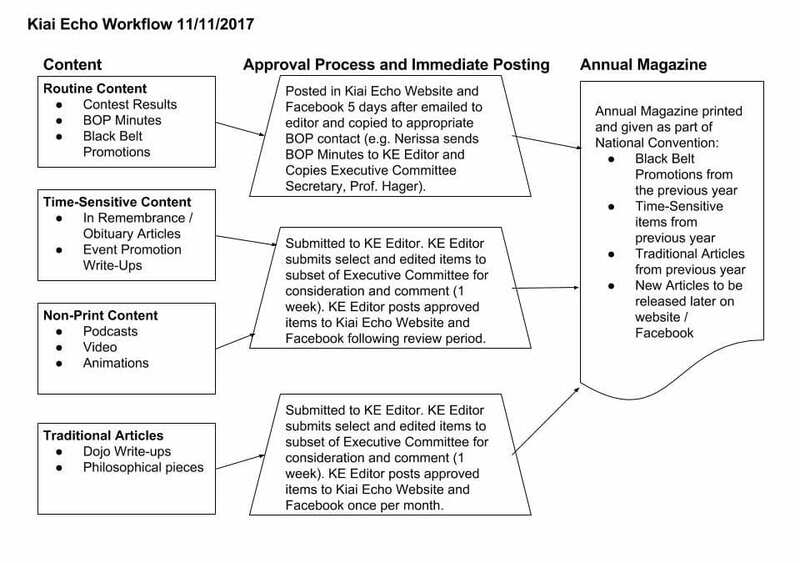 In order to diversify and speed up content delivery, energize the submission of material, and increase exposure, we have devised a new workflow for the Kiai Echo. Most of this content will also be public immediately, as part of our effort to attract a broader membership to the AJJF. The Kiai Echo Editor will post contest results and Black Belt promotions immediately as they are received. These will be published online and promoted via social media (Facebook and Twitter). They will not be password protected, but will be immediately publicly available. notice will be sent to the black belt list each time content is posted. By the time this material is submitted to the Kiai Echo, it has already been approved by the appropriate BOP members o and thus requires no further approval process. 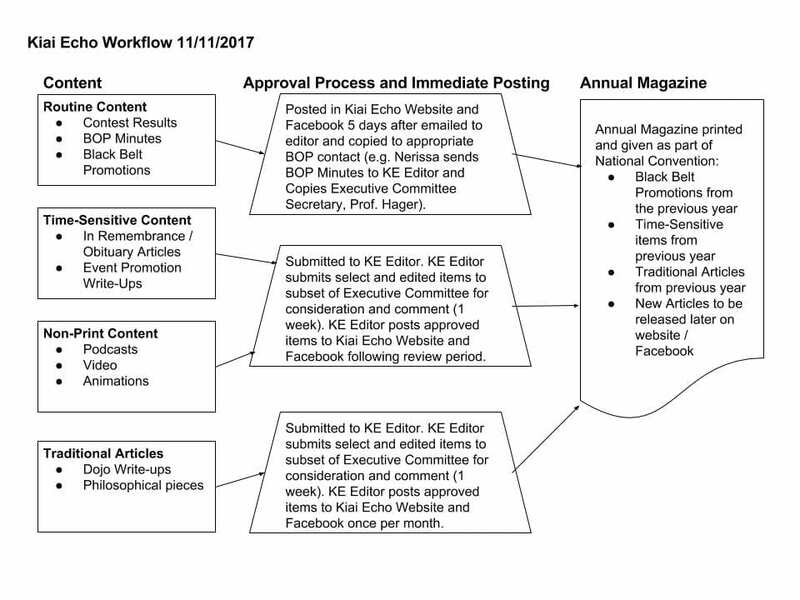 Each instance of this type will not generate mass email to all AJJF members (due to associated costs each time this is done), but will automatically generate Facebook updates. An annual email to all membership will still point to this content (see below). Traditional articles, as well as anything that is not native to print (i.e. podcasts, video, 3D animations, etc. ), will go through an approval process. Finally, Several people have mentioned that they miss the print version. Putting together a downloadable PDF and Print version is the largest workload among available formats. We have decided a once-per-year anthology will be the best way to deliver this format and we are exploring different ways to provide it. We will have to weigh costs, as the print and mail format is the most expensive. One option being considered is a complimentary copy provided at the AJJF National Convention. Certainly a print and mail (at individual cost) option will continue for everyone. We suspect there will be a few more kinks to work out as we proceed, but we are excited to begin delivering content more quickly and more regularly. If you have questions or concerns, please don’t hesitate to contact the editor, Jason Davis: kiaiecho@ajjf.org.